For the ninth consecutive year, UBC Library and the Alma Mater Student Society of UBC are once again running their Food for Fines Campaign. 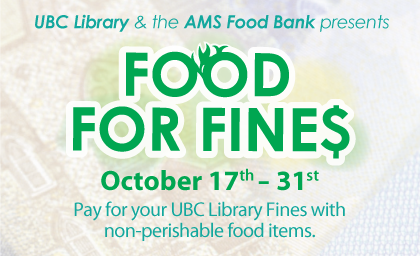 Reduce your library fines by donating non-perishable food items. Each food item donated counts toward $2 in fines, up to a maximum of $30. Donated items will be distributed to the Greater Vancouver Food Bank and the AMS Food Bank. The program takes place from October 17 – 31 inclusive. Help us raise exceed our goal of raising more than $5,000 in donations to helping those who need it the most in our communities. Review the list of most-needed items by the Food Banks. Find out more about this program by visiting the Food for Fines Facebook page or emailing the AMS Food Bank. Donations received at UBC’s Okanagan campus will go to the UBC Okanagan Student Food Bank.